One of my FAVORITE weekends of the year is Memorial Day weekend because of the the Florida Folk Festival! This is one of the oldest and largest music festivals in the country, dating all the way back to 1952. How cool is that!? 3 whole days of music, dancing, food, and art that make Florida unique. There are so many beautiful art forms that I don't get to experience in the day-to-day hustle in West Palm Beach, but I love that they aren't getting lost in this new generation. 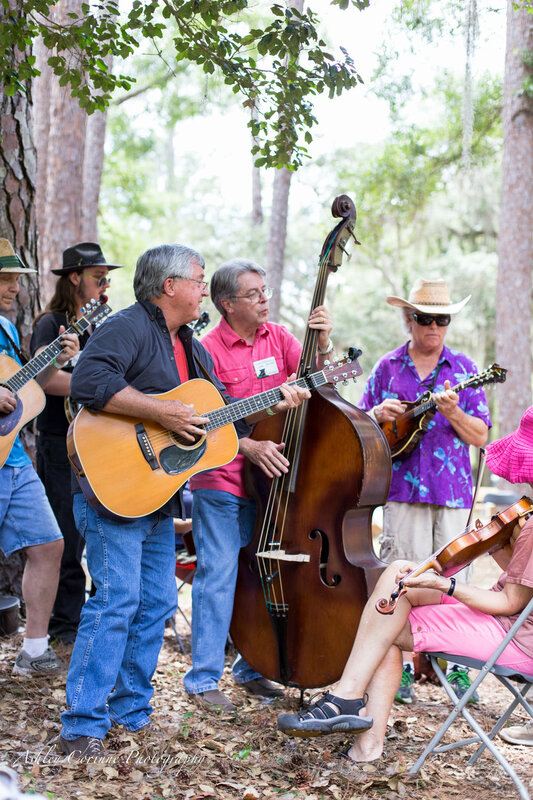 The Folk Fest weekend is set in one of the most beautiful parks in the state, right along the Suwannee River, Stephen Foster Folk Culture Center State Park in White Springs, FL. Every year we add more people the group that goes to the Folk Fest. It's THAT good. 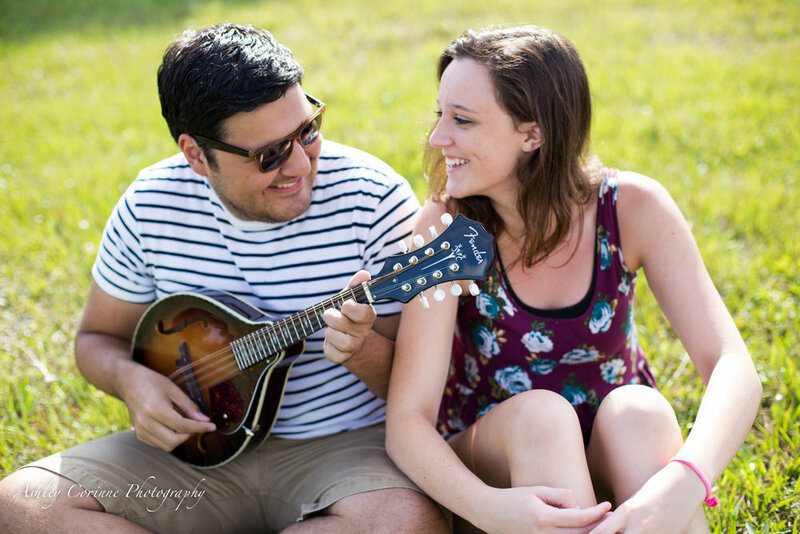 First it was just my grandparents, who came back telling us about a barefoot banjo playing girl who we now know as the lead of Jubal's Kin, which you can check out here. 3 years later and our tribe has grown to 11 people, some of my favorite people in the whole world! Our trip started off a little bumpy, with a blown tire about 30 miles from home on the turnpike. Normally I'd freak out, maybe feel a little bummed out, but not with this group! We just got out our instruments and jammed out on the side of the road (a safe distance from the turnpike). Seriously, how precious are those pics of Kendall and Bernie!? You'd never guess we were stranded with those smiles! I can't even count how many semis honked at us as they passed. In about 45 minutes AAA arrived to help put on the spare tire, and then we were on the road again, but not before we snagged a sweet family photo! 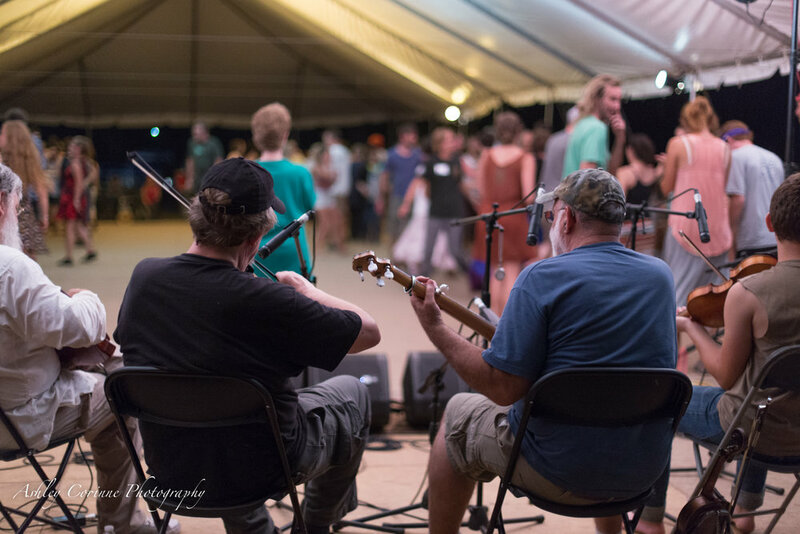 The Heritage stage greets every person as they enter the festival, situated directly in front of a tall tower that serves as a museum and storytelling venue. I like that it's called the "heritage" stage because that is what the entire weekend was focused around for me - discovering my heritage as a Floridian and as a Southerner. My whole family has been Floridian for many generations, mining, farming, fishing, and keeping music and food at the center of every gathering. This weekend let me reach deeper into my past, my heritage, and discover more of what makes my family's culture unique. 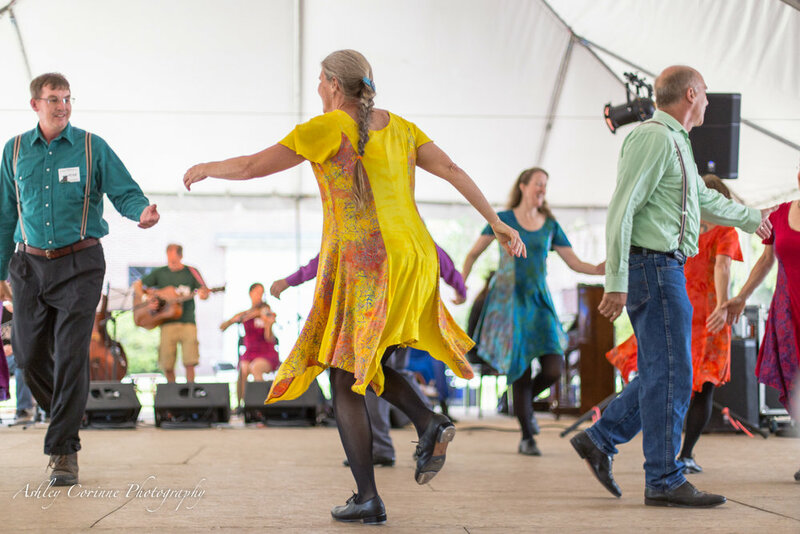 The Cross Creek Cloggers were featured on the Heritage Stage both Saturday and Sunday, showing us the history of clogging, from broom dances to wooden-shoe clogging that used to keep the harvest flowing in rhythm, square dances, and even modern day tap. I loved seeing their joy and energy and they passed down this tradition to a new audience each day. At Stephen Foster State Park there are so many different areas to explore! Walk one way and you hit the craft village, the Seminole Area, which had the BEST banana fry bread, and the Suwannee River. As we passed the Seminole stage, a band called "Wax Wings" was starting a set. It caught my attention because it's not every day that you see a band with a banjo, fiddle, accordion, and sousaphone. 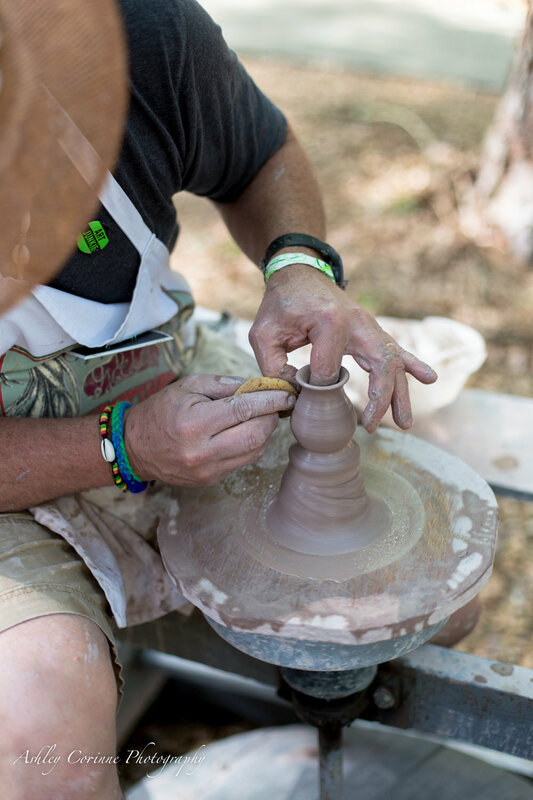 I really enjoyed watching Matt Brabham of Brabham Pottery at work on his pottery wheel. 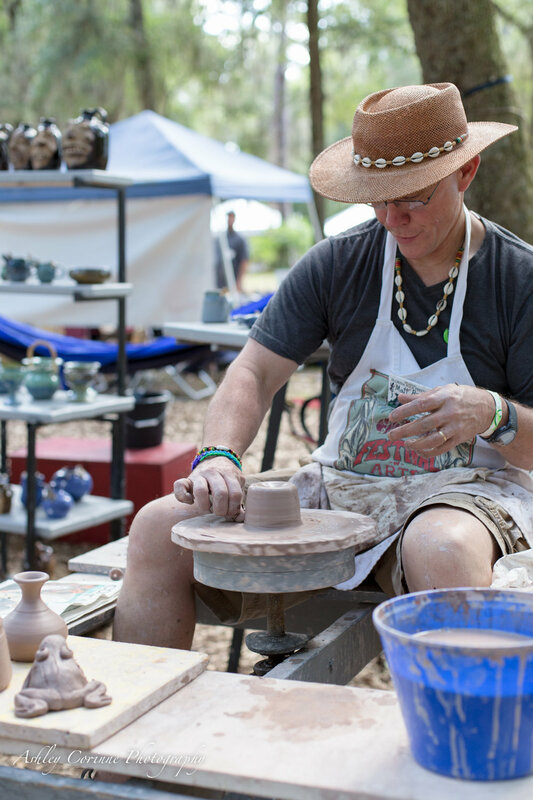 He's a teacher during the school year and keeps up the old tradition of folk pottery with lizard and frog motifs. I watched him effortlessly make a bowl and a vase while chatting it up about life and the traditional pottery techniques. He told me about a man he knew that was a 10th generation potter, learning the old school techniques from his father and keeping an unbroken tradition. I think it's so important that we cherish and support these local art forms and the heritage that they continue to infuse into our culture. If you want to visit Brabham Pottery's website and see some of his finished products, click here. 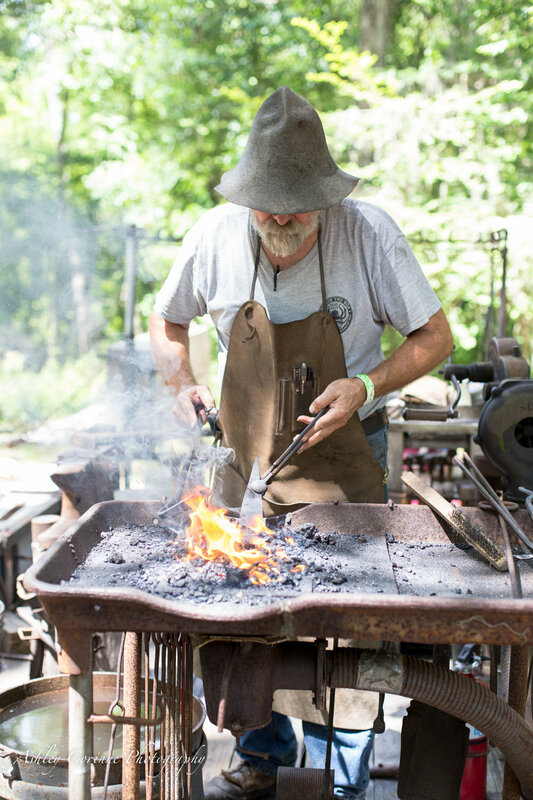 One of the coolest artists I met at the Folk Festival was Ben Rogers the blacksmith. 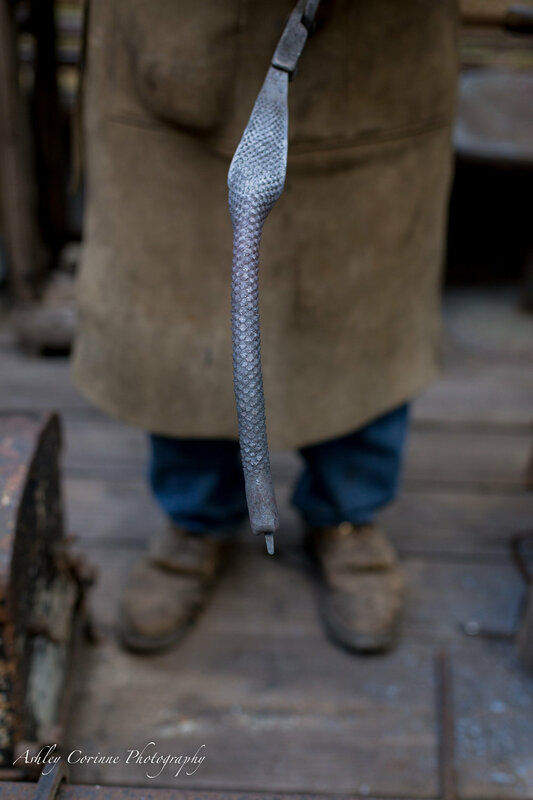 I think I stood at his trailer for hours as he crafted a snake for a customer with a furnace about 1800 degrees Fahrenheit. He worked with an ease of someone who has been doing it for a long time, chatting it up with me and the other people passing by. 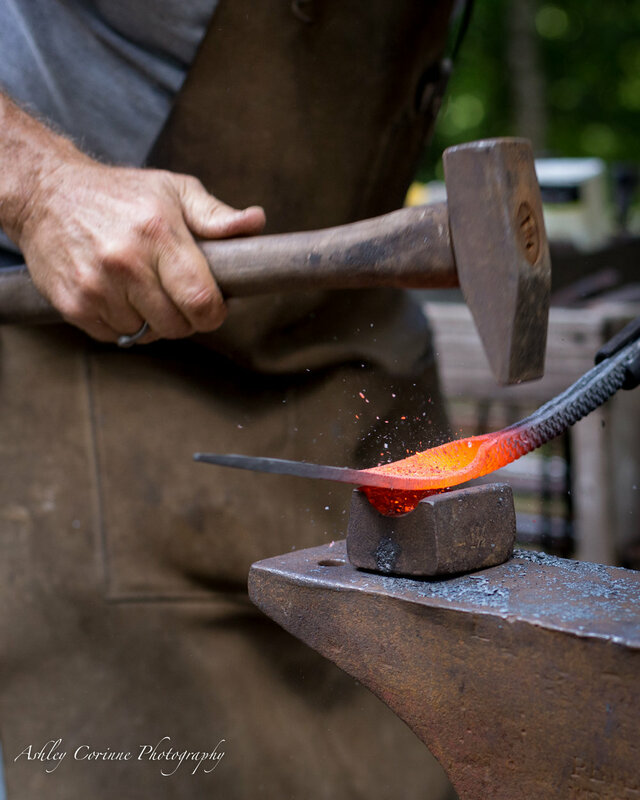 Ben was a hobbiest blacksmith for 10 years before he went full time, and told me he was incredibly thankful when his employer laid him off in 2008. It was inspiring to hear another creative entrepreneur take a scary situation like unemployment during the recession and turn it into an incredible opportunity to follow your dreams. 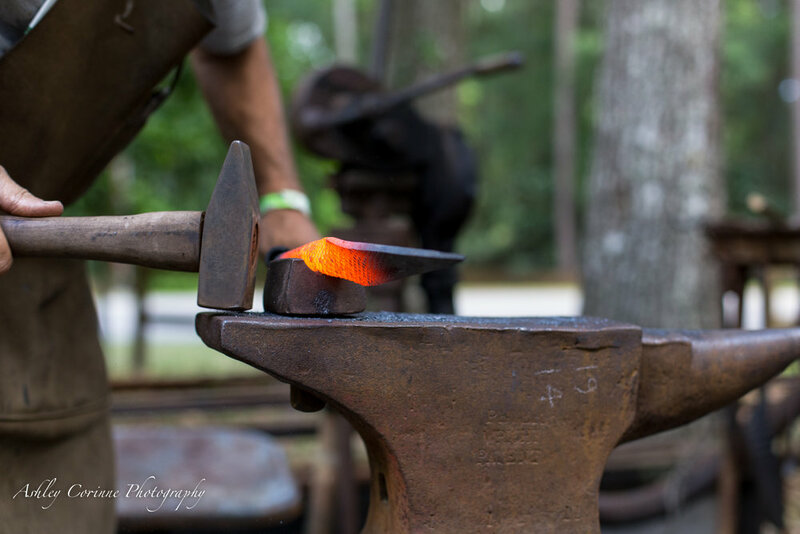 Ben taught me how to tune an anvil so that it makes a specific pitch when you hit it. When the anvil is tuned you can hit it with your hammer and it rebounds back up on its own to give your arm some relief. 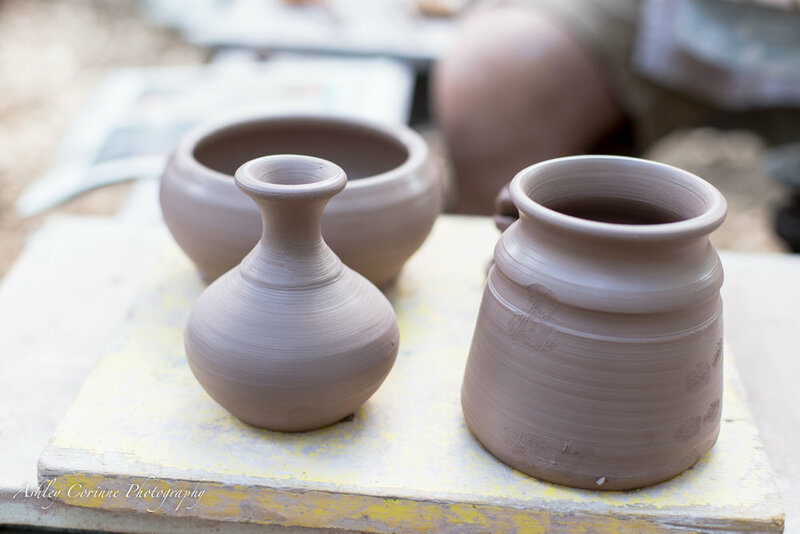 Ben said, "The beauty of the craft is it will keep you on your toes, it will throw you a curve, and I don't care how long you do it, you'll still mess it up." Located right next to Ben the Blacksmith was Robert Wilson the Trapper/Trader. In real life, Robert is a gunsmith, you can find him on Facebook as Wizard's Gun Shop. At the festival he represents a historically accurate trapper/trader from the 1740-1840 time period, complete with his own handmade leather suit, which he's been using for 2 decades. He taught me the different uses for hides of varying thickness and also the reasoning behind the fringe on his leather suit. The fringe is utilized to minimize the moisture in the suit, pulling it from the surface to the fringe 4x faster than a suit without fringe! 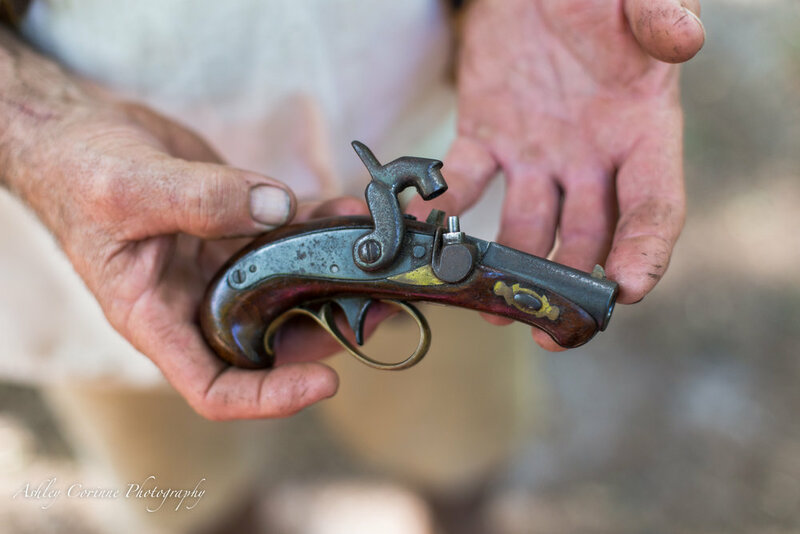 He also showed me some of the guns he's collected over the years, the gilded one from a royal guard with a skull-crushing pommel, and the same kind of Derringer pistol that was used to assassinate Abraham Lincoln. Under the trees and a bit off the beaten path, jam sessions sprung up. Some were planned, others not so much. I really enjoyed taking out my banjo and playing along when I could. I learned a lot from sitting around and playing by ear, just like my grandpa used to in his family jam sessions decades ago. What really stuck out to me was the kindness of those around me, incredibly talented yet willing to tolerate my ignorance and help me along as we played. The group pictured here was the Peyton/Waite Trio leading the Bluegrass jam and surrounded by about 30 other players with all kinds of instruments. 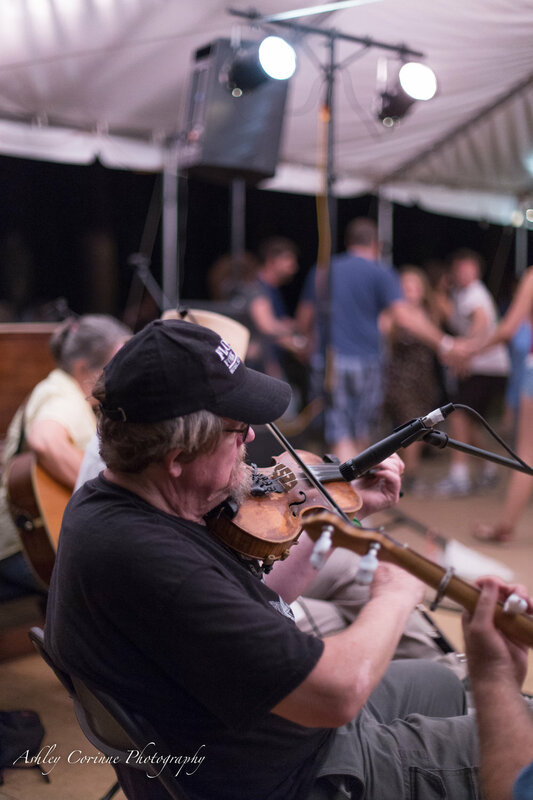 Each night ended wonderfully with contra dancing under the stars at the Heritage Stage. 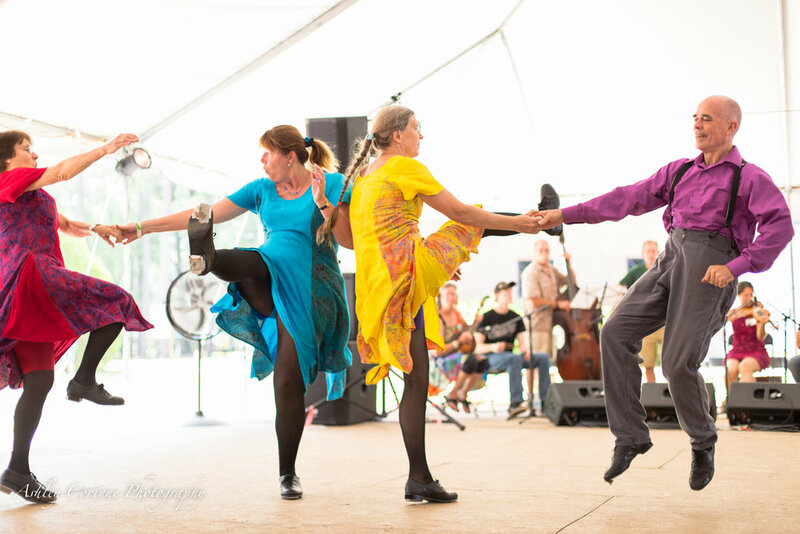 There was a live band and caller that switched out every few hours and people from all over the festival gathered to swing their partner and dosey do their neighbor. 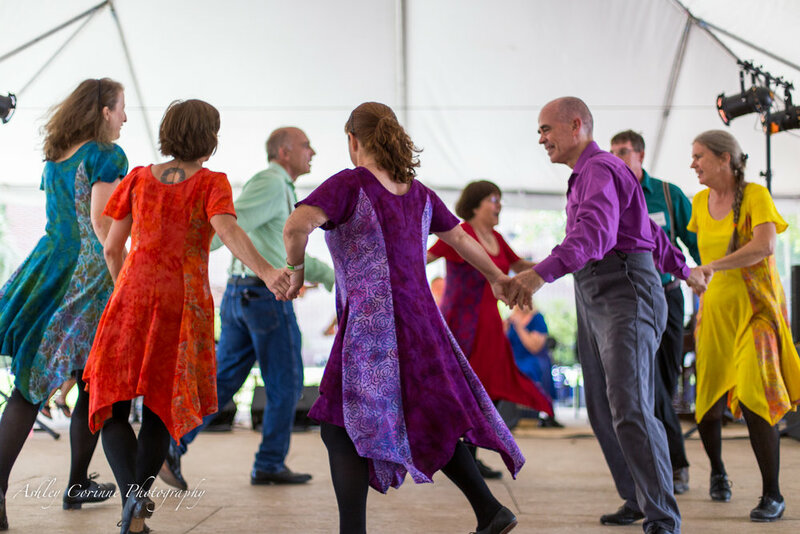 I love this form of dance because unlike many dances it allows you to meet and interact with everyone on the dance floor. By the third night of contra dancing we had made friends with people from all over and burned a few hundred calories as well! 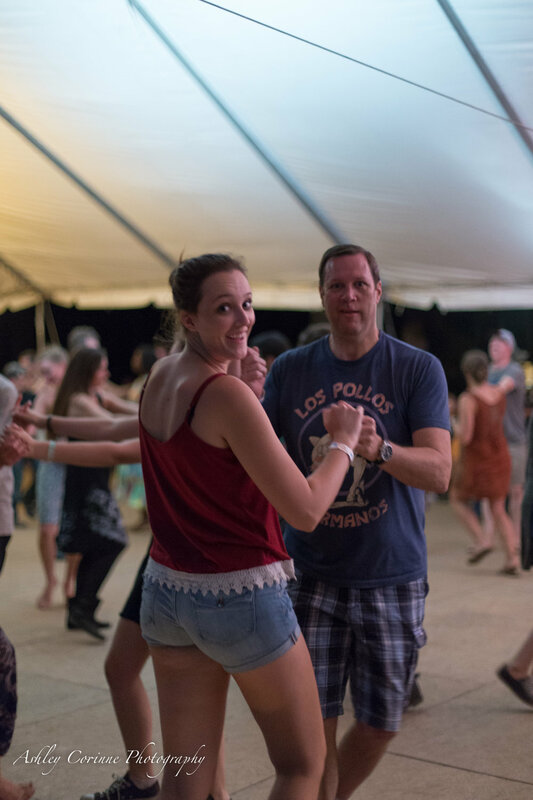 I've got to give a huge thank you to my second-shooter/sister's boyfriend, Bernie Pino, for his great night-time shots of the contra dancing and musicians as well! Overall it was one of the best weekends of the entire year with family and friends, old and new. I am already counting down the days until next year's event!